The next time the iconic UNCG bell clangs, it will do so, fittingly, from atop a base worthy of its grandeur. The bell’s facelift was complete July 26, just in time to welcome students into a new year at the inaugural NAV1GATE New Student Convocation on Aug. 14. “This new frame respects the history of the bell, and gives it the prominence it deserves,” said Dr. Kim Sousa-Peoples, director of new student transitions and first year experience. Eighteen months ago, in an effort to meet Chancellor Gilliam’s “Giant Steps” challenge, Sousa-Peoples envisioned an idea to spruce up the timeworn symbol. “There was a new expectation that we come out and show our best,” she said. It was time for the old bell’s facade to better reflect the formality of occasions such as Founders Day, commencement and ribbon-cuttings, where it has been used since 1897 as a call to gather. She reached out to Fred Patrick, former director of engineering and construction management, who retired in Jan. 2016 after 28 years at UNCG, and the pair came up with plans for refurbishing the bell’s base. The bell had had a more simple welded base with rollers. Patrick had an $8,000 budget and a deadline of Aug. 1, so the updated bell would arrive back on campus in time for NAV1GATE. Installing seal in Gallucci’s studio. Gallucci is on the right. After a quick sketch, Patrick enlisted the design help of renowned sculptor Jim Gallucci, a former sculpture instructor in the art department at UNCG, and alumnus Eric Little, a former staff member in UNCG’s carpentry shop. 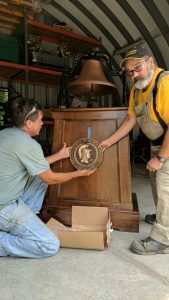 On Wednesday, July 26, the restored bell rolled onto campus a week shy of the deadline. It now sits 48 inches high (its ringers no longer have to bend over) on a gleaming polyurethane-coated walnut wood platform. And to ensure the historic bell’s forever home at UNCG, Spartan is stamped on either side of the base in the form of two 12-inch bronze academic seals. Visual: Bell on its new stand is transported back to campus from Gallucci’s studio.